Our expertise and in-depth industry knowledge in the respective field help us provide optimum quality range of GSM Pump Control and Tank Level Monitoring. At our state-of-the-art manufacturing unit, these products are developed in compliance with the latest technological advancements in the market. With the help of GSM technology, these devices provide excellent security and can control the system only with the help of authorized mobile numbers and users can be added by the one having administrative rights. In addition, the entire configuration done can be used with mobile or though the mode key. Very often farmers will have to travel a long distance just to switch ON/OFF their motor pump to irrigate their fields, sometimes they will have to travel to remote places to do the same, there is always a possibility that the farmer may be attacked by wild animals, snakes, etc. which is a source of major problem. Also the farmers will have to deal with miscreants by preventing vandalism and theft. Existing aids like auto-starters are unreliable and incapable of communicating the operating state of the motor. When a farmer has more than one motor pump set he has to run around to make sure that all the motor pumps are working when the power is available. The GSM pump starter controller is an innovative product from I2R LABS helps the farmers by preventing the need for the physical presence of the farmer all the time to control the motor pump. The farmer as an administrator can control the motor pump by just giving a missed call. After 3 rings the call is disconnected and the motor is switched ON, similarly the motor can be switched OFF by 7 rings. Thus the farmer can also know the status of the motor whether it is switched ON/OFF i.e. if there is more than 3 rings the farmer can know that the motor was ON. Please note the pump control unit will disconnect call based on status of the pump. If the pump is ON and when a call is made the unit it will disconnect the call after 7 rings in the same way if the pump was OFF the unit will disconnect the call from 3 rings and switches ON the pump. 2. Support 3 phase and 1 phase motor. Very often farmers will have to travel a long distance just to switch ON/OFF their motor pump to irrigate their fields, sometimes they will have to travel to remote places to do the same, there is always a possibility that the farmer may be attacked by wild animals, snakes, etc. which is a source of major problem.Also the farmers will have to deal with miscreants by preventing vandalism and theft. Existing aids like auto-starters are unreliable and incapable of communicating the operating state of the motor. When a farmer has more than one motor pump set he has to run around to make sure that allthe motor pumps are working when the power is available. The GSM pump starter controller is an innovative product from I2R LABS helps the farmers by preventing the need for the physical presence of the farmer all the time to control the motor pump.The farmer as an administrator can control the motor pump by just giving a missed call. After 3 rings the call is disconnected and the motor is switched ON, similarly the motor can be switched OFF by 7 rings. Thus the farmer can also know the status of the motor whether it is switched ON/OFF i.e. if there is more than 3 rings the farmer can know that the motor was ON. 12. Time based On OFF control. 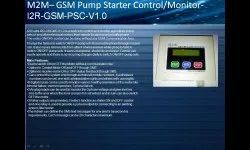 Looking for GSM Pump Control and Tank Level Monitoring ?